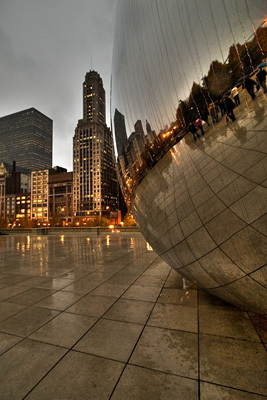 Grab Shot 101 - "Rainy Chicago Evening"
"I took this last November in Chicago on a rainy evening at Millennium Park," said Julianne Fishell. "I used a Canon 30D with the fab Canon EF-S 10-22mm lens. (ISO 1600, 1/60, f5.0)." "Thanks to your podcast on packing for a trip, I had a a ziploc bag in my camera bag, which I was using to keep my camera dry from the pouring rain. Thanks to you (again! ), I've been using Adobe Photoshop Lightroom for about a month now and have been rediscovering pictures that I never bothered to look at or process before, this image being one of them. From Lightroom I exported the original RAW to Photoshop as a 16-bit TIFF. I copied it to a second layer and used the Photomatix plug-in to tonemap the image, adding a touch of HDR. Then I did a curves adjustment, layer, and some sharpening."